This lesson will show you how to insert a ScreenSteps lesson into an existing page in Mindtouch. This can be useful in circumstances where you need to insert material with lots of images into a section of a page that is primarily made up of text. Before beginning this lesson you should have configured a Web Export account for your Mindtouch server. 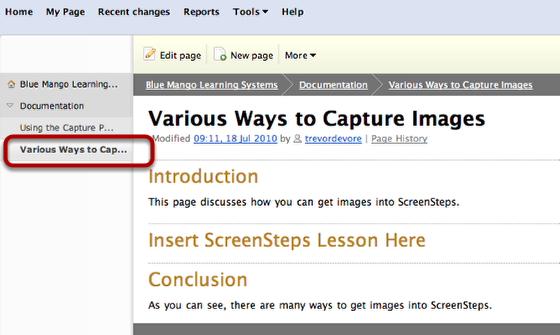 Before uploading your ScreenSteps lesson to Mindtouch you need to locate the page you want to insert the lesson into. 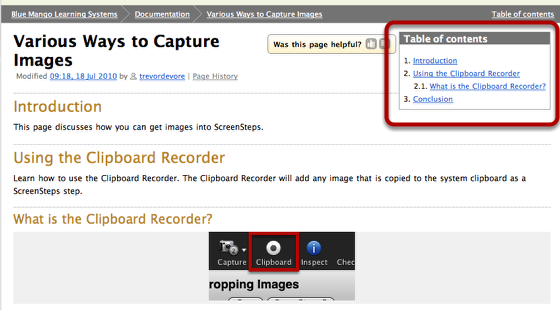 In this example I'm going to insert a lesson into the Various Ways to Capture Images page. After locating the page, select and copy the path segment of the url as demonstrated in this image. When inserting a lesson into an existing Mindtouch page you specify a section number as a target. A Mindtouch page has one section for every header that appears on the page. You can see a list of sections in a page by clicking on the Table of Contents link. In this example, my page has three sections. I'm going to insert my lesson into the Insert ScreenSteps Lesson Here section. 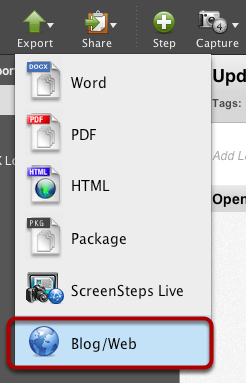 It is the second section on the page so I will target section 2 when I upload from ScreenSteps to Mindtouch. Now that I have the url on the clipboard and the section number I'm going to replace with my lesson content, I can upload the lesson. Open the lesson you want to upload and select Blog/Web from the Export menu. After selecting the your Mindtouch account (1) you should see this screen. Click on the Insert Into Existing Page tab (2) and paste the url you copied into the Insert Into Page field (3). Enter the number of the section you want to replace with the lesson content in the Replacing Section field (4). 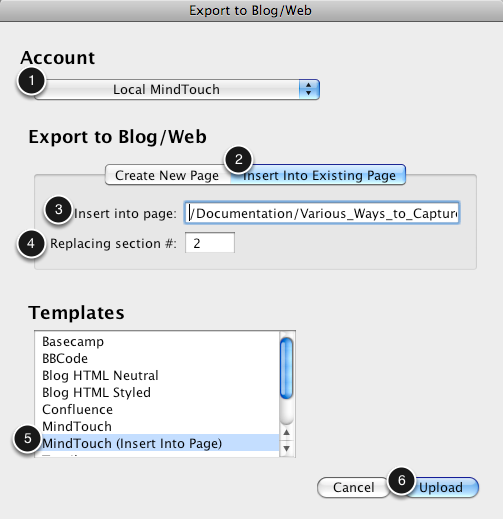 Make sure you use the Mindtouch (Insert Into Page) template when uploading (5). This template was included with ScreenSteps 2.8.5 and is designed for inserting lesson content into an existing Mindtouch page. After the lesson finishes uploading click on the Visit button to view the page in your browser. As you can see, the page has been updated to included my lesson content. The Introduction and Conclusion sections of the page are still intact. The table of contents now contains the name of my lesson as well as the name of any steps. 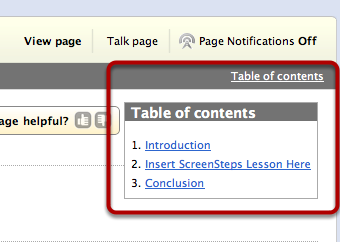 If later on you change the lesson in ScreenSteps you can update the page in Mindtouch. Refer to our lesson on updating for instructions on how to do that.